Surprise, The Grammys Are Worth Watching This Year! Just when I was ready to write off the historically out-of-touch and one-step-behind awards show, the Grammys have pulled me back in. And we can thank social media, mobile and several timely musical nominations for making the usually irrelevant, retrogressive and disconnected TV event more interactive, relevant and interesting than it’s ever been for fans. Before we get to the music part of the Grammys, let’s see what they got cooking on the mobile, social and interactive side. 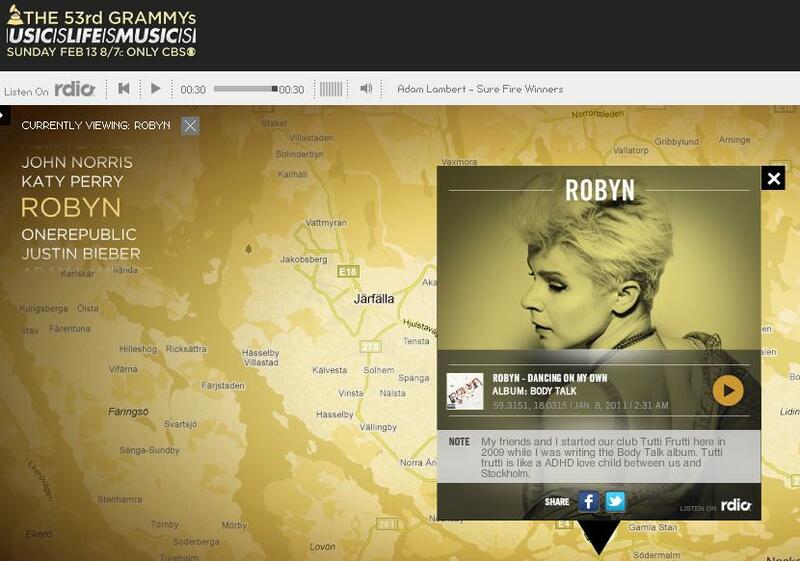 Last year, we told you about the Grammys award-winning “We Are All Fans” interactive experience. And this year, with the increasing popularity of mobile, the Grammys have taken things several steps forward and created an interactive site called “Music Is Life Is Music,” which is also available as a corresponding mobile app (iPhone & Droid) called the Music Mapper. Together the combined experience takes fans into the music of the Grammys nominees by allowing you to learn and share memories about the artists, and your listening and live concert experiences in the context of specific locations on a map. I’ve been playing around with the Music Mapper app and so far it’s a been really fun to explore and discover what other fans are posting and sharing. I especially like the short fan entries and updates on the site experience where fans have shared how a certain concert experience changed their life. And when I read how pop music or a particular artist that I might not like at first, is put into an emotional context by other fans, I gain a new appreciation for that artist thanks to a fan’s enlightening post. And that’s why I think “Music Is Life” is a great site that you should check out. When: Los Angeles on Sunday, February 13 at 6:00pm ET/3:00pm PT. What: Featuring interviews with some of the biggest stars in entertainment honoring music’s best. Where: Viewers are invited to watch event at www.livestream.com/aplive, or via the player below. According to MTV, Instagram coverage will come courtesy of MTV News‘s Sway Calloway, and Jersey Shore‘s infamous Snooki. Grammy fans can follow the @MTV Instagram account or search for #MTV or #MTVNews to see pics from the event. MTV will also live stream red carpet shenanigans on MTV.com from 6 p.m. to 8 p.m. ET on Sunday. If you haven’t already, you can download the Instagram iPhone app here. If you’re new to the app, I can tell you that it’s a pretty cool app and I’ve seen it in action many time. It was used to take one of the pictures from our Grinderman exploration as a fan made excellent use of the Instagram app during the show. And it makes perfect sense that MTV would find a way to creatively integrate the app into the fan experience during the Grammys. We’ll see how it goes, and if you’re using it during the show, we’d love to hear what you think. How will Lady Gaga top her convincing AMAs show with her “Born This Way” performance? We heard the first stages of the song live at Lollapalooza. And after that show, I’m thinking it’s not whether Gaga will drop jaws during her Grammys set, but how far the jaws will drop. We’ve had pleasure tweeting the Grammys before. But besides social media making the show more interesting and fun to watch, there’s several reasons why we’re also going to keep a close eye on the Grammys this year. For starters, we’re excited to continue our live exploration of Katy Perry, Cee-Lo Green, Justin Beiber a clear-eyed Eminem. And we’re hoping the Arcade Fire win an award too with The Suburbs, since their live show was one of our favorite of 2010. We’re also looking forward to Mick Jagger’s first appearance on the Grammy stage, even though it’ll be a solo gig without the other Rolling Stones. With Jennifer Hudson and Christina Augilera teaming up to honor Aretha Franklin, we’re wondering if Augilera will redeem herself from her Super Bowl National Anthem lyrical snafu? And what about the backstage conversations? Will Hudson offer Augilera some tips so she doesn’t get lost in the moment again and forget the lyrics tonight? What are you most excited about for the 53rd Grammys? Who do you think has put on the best live show at the Grammys ever? Do you think this year’s show has gotten better or worse? Has both the music and integration of social media and mobile made the show worth watching again?